The Jordanian Atomic Energy Commission signed an agreement on September 22 with Russia’s Rosatom that will result in a contract to build and operate two 1000 MW VVER light water reactors. Rosatom will finance 49.9% of the venture which is estimated to be worth $10 billion which brings in the units at $5000/Kw. Unlike previous negotiations with Areva, which did not pan out, Jordan will not offer to swap uranium from its native deposits to pay for the power station. However, the Jordanian government said it needs to come up with just over $5 billion to finance its share of the project. It is offering equity investors the opportunity to buy minority stakes in the reactor project. If it can get investors to pick up another 25% of the project, its share would be reduced to $2.5 billion. Still to be determined is what price would be charged for electricity from the power station. Over the next two years Jordan will conduct necessary studies on cooling water supplies, environmental impacts, and other engineering feasibility work which will be paid for by the Jordanian government. Russian technical specialists will help carry out the studies. The first reactor is expected to begin revenue service in 2021 and the second one four years later. 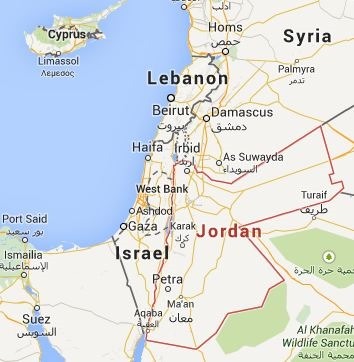 The reactors are reported to be planned to be located near Amman, Jordan, at Mafraq City, about 80 Km (50 miles) to the north which is near the Syrian border. Cooling water would come from a wastewater treatment plant in a design similar to the one used by the Palo Verde reactor in Arizona. A proposed site on the Red Sea turned out to require costly seismic construction elements according to an engineering analysis by the Belgium firm Tractabel, a subsidiary of GDF Suez. In addition to generating electricity for consumer and industrial users, it will also divert some of its power via transmission lines to run salt water desalinization facilities planned to be located along the Red Sea coast near the port of Aqaba. As a practical matter, Rosatom’s usual policy is to control all nuclear fuel provided for reactors it exports to and operates in other countries. Also, Rosatom takes back the spent nuclear fuel. That said there is still some excitement in Jordan about using the value of uranium exports to offset the cost of the reactor deal, but not as a direct transaction with Rosatom. Prior to the Rosatom agreement Jordan considered building an 650 MW AECL Candu-6 reactor and also an 1100 MW design developed by a joint venture of Areva and Mitsubishi. The Jordanian Mining Company announced plans in May to develop the country’s known uranium reserves which are reported to be in the range of approximately 36,000 metric tonnes. The mining firm will seek equity partners to pay for development of the mine. The mining firm said that development and operation of the mine will be completely separate from the nuclear reactor project. However, World Nuclear News reported on September 23 that a 2009 agreement with Russia calls for some level of involvement in the mine. In 2012 Jordan ended its work with Areva to develop its uranium reserves which were at that time described as being in the range of just 20,000 metric tonnes. Jordan cited “contractual differences” as the basis for its withdrawal from the arrangement. During the period 2008 to 2012 Areva worked with Jordanian miners to characterize the uranium deposits. According to reports in the Jordanian English language news media, Areva said there were “challenges” to actually getting the uranium out of the ground due to the deposits being “intermittent” and in lower grades than what would be commercially acceptable. Rio Tinto reported similar disappointing results also in 2012 after spending two years looking at the uranium deposits. According to Rio Tinto, one of the characteristics of the area that initially caught their interest in 2010 is that the uranium is found at a relatively shallow depth of 15-30 meters (50-100 feet). This factor would support a plan for an open pit mine. Minimum yields would need to be in the range of 1-4 pounds of U3O8 per ton of ore. If the yields are below that, and the price of uranium is too low, the mine isn’t viable. The cost of a hard rock uranium mill to produce yellowcake would also factor going into the issue of the viability of the deposits, which could be $75-150 million depending on how much processing capacity would be built. The initial ambitions for production from the mine are reported to be 300-400 metric tonnes per year with longer term prospects, assuming the mine is profitable, of production up to 1500 metric tonnes per year. World Nuclear News has identified the location of the uranium deposits as being in a 1400 square kilometer area (540 square miles) in the central region, including the Siwaqa, Khan Azzabib, Wadi Maghar and Attarat areas. Jordan has several options for getting value from the uranium mine including selling the uranium oxide to nuclear utilities, including Rosatom, or engaging in more complicated deals which would arrange for enrichment and fuel fabrication by other firms. Jordan has no reported plans to develop its own uranium enrichment facility. In the end Jordan still needs a mining company that thinks the uranium deposits make business sense, and, equally, a high enough price for uranium that will stay put long enough to bring the mine into production and sell the product. This entry was posted in Jordan, Nuclear, Rosatom. Bookmark the permalink.